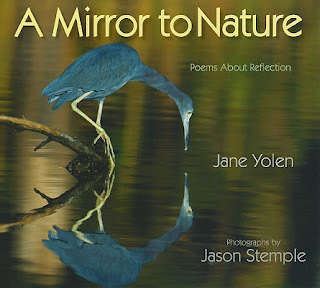 Inspired by the reflective qualities of water and the amazing animals that live in the wild, Jane Yolen wrote some poetry. The photographs are fantastic. However, the poetry doesn't fit the scenic photos, they seem rather silly and childish. For example on page 16 is a wonderful picture of a young buck walking through a marshy area. On the facing page is the poem titled, "The Deer Reflects Himself". That doesn't seem nature-inspiring to me. Unfortunately I feel this was a missed opportunity for the author to share her love of nature with young people. The photographs combined with a different style of poetry would have made a wonderful book. Likewise, the poems accompanied by illustrations or less-serious photography would have been a great book as well.